Just down the road from Hither Green lies Kidbrooke, and what’s left of the Ferrier Estate. Built in the 1960s-70s, it’s now in the process of being “developed” – development, in this case, meaning knocking much of it down and starting again. Many of the buildings are now sitting empty, windows smashed out, Sky dishes aiming pointlessly up, wet curtains billowing in the wind. Plants are even beginning to grow into and over some blocks. It’s an interesting place. On one hand, its current state of delapidation is almost epic, and past residents have written of its numerous problems: crime, gangs, rats, water supply problems and ants (see comments here). The buildings, created from huge slabs of concrete, have not aged well, and have a depressingly monolithic look to rival the kind of Soviet housing you see in much of Eastern Europe. But despite all that, take even a quick glance at what’s left of the Ferrier Estate and you see what the GLC was aiming for when it constructed it. 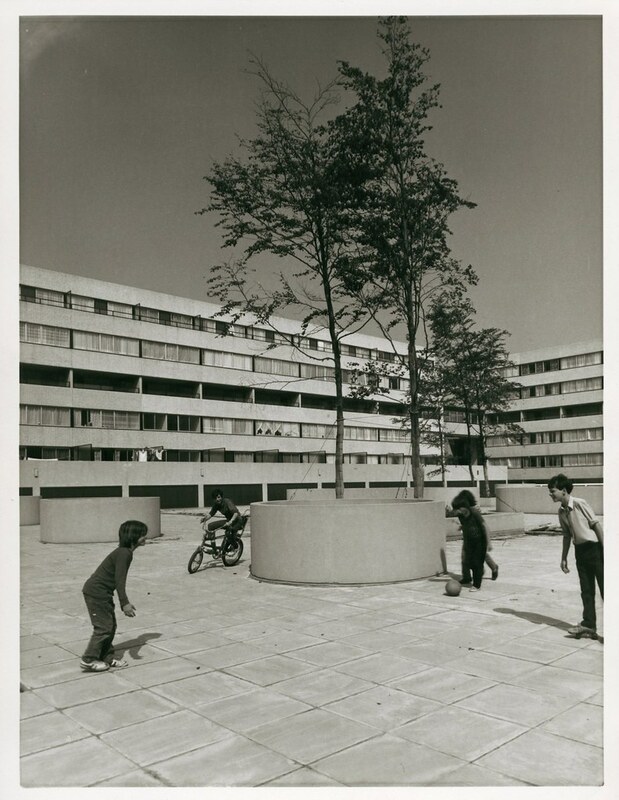 The huge low-rise blocks were to provide large quantities of much-needed social housing, set in landscaped grounds rather than rows of terraced blocks like those near Waterloo, and with communal spaces even above ground level courtesy of the walkways – a bit of classic modernism. A huge boiler was to provide heat and hot water for all, and there were schools on-site. These pictures from the time show the estate as it was when newly constructed – it’s unclear whether these were posed, but even if so you get the idea of what the GLC was aiming for. And, of course, it all fell apart. The boiler system failed, the covered car park shown in the second photo above had to be removed for security reasons, and the open walkways were divided off. Now, 40 years on, the whole thing’s about to be taken down. With 20/20 hindsight it’s easy to judge this kind of project harshly. It’ll be interesting, though, to see what people are saying about the new, replacement housing that’s due to be built after it’s been up for 40 years – and if it even lasts that long. The colour photos here were taken yesterday – more can be found in my Flickr set. 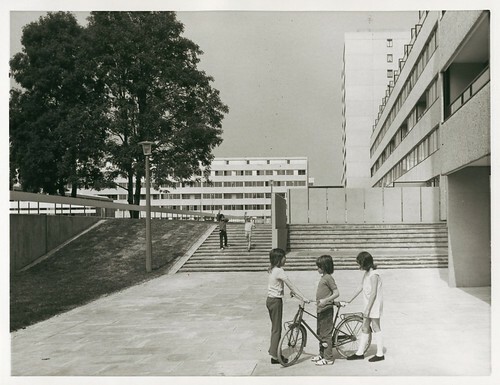 The black-and-white photos were taken around the time the estate was built by the GLC Architects’ Department, and are reproduced here from Iqbal Alam‘s excellent Flickr set, which also contains some excellent information about the Ferrier Estate and the GLC. These photos are presumably copyrighted, but it’s unclear as to who owns those rights now.